to review Watcher. I'm not sure I'm opposed to the overall idea, necessarily, but it looks to me like it needs some work still. Kind of unrelated, but: I was just wondering if there was a similar thread for C3V customs. I have some questions about them (which aren't necessarily gameplay related), and I was curious as to whether or not C3V has a similar -albeit less used- thread. What are you looking for BB? Most questions/debates are brought up in the Books. The Watcher by William099 has received 4 NO votes to review (Super Bogue, superfrog, nyys, and capsocrates) and is removed from the process. Valkrill’s dragon, as imagined by Scytale, uses some innovative mechanics to create a mid-priced dragon with a neat variable special attack. Marker-based powers are always a little scary, but the Heat Blast Special Attack/Growing heat mechanic bucks the trend of these powers in its elegant simplicity. Obvious comparisons need to be made to Mimring and Othkurik, the two dragons nearest Brimstone’s point cost. Each of these dragons has one more attack but one less defense than Brimstone, and all three of them have a special attack that can get 4 attack dice, but Brimstone’s does not activate quite as often. Othkurik’s Acid Spray can hit up to 3 figures, Mimring’s Fire Line can hit up to 8 (disregarding spiders on ladders) but Brimstone’s can hit up to 18 spaces. That’s a lot. Now unless you manage to fly into an unfortunately placed hole in your opponent’s start zone, you’re not going to get 18 targets for Heat Blast Special Attack, but still, that’s nothing to scoff at, and makes up for the fact that the special attack is not always 4 dice, at least on paper. Brimstone is a good fit for Valkrill, sacrificing his own figures if necessary with his Heat Blast SA. Like Othkurik, he is a young, which is a D&D classification, so rest assured, this little bite-sized dragon is not from Icaria. He is a bit smaller than Othkurik, but looks right at home with the Greenscale Warriors. Menacing fits this guy well, too, because he’s always building up his power for a devastating attack. Heat Blast is derived from D&D powers, according to Scytale, and it translates very well to Brimstone’s card. 2 spaces is the perfect range for the attack, too, as 3 would have been way too many, and 1 space would not do the attack justice. The only real issue I have is with the name. Othkurik is the most similar dragon thematically (both D&D, both young) and Brimstone’s name just doesn’t sit quite right with me in comparison. His name more closely fits with Moltenclaw, who is a prince to Brimstone’s young, so I would have preferred a name more similar to Othkurik in its nature. Not really a problem, though. Heat Blast Special Attack is something not done with markers on other cards, but in my experience, it was not hard to keep track of markers (i just used upside-down power glyphs, that was very easy), and the combination of powers is very intuitive. Brimstone has the sort of power set that becomes second nature to the player after a few games, and really does not cause any problem mid-game where you have to go back and read the card more thoroughly. Brimstone works best in Greenscale armies. He can fly ahead and blast, and the Greenies can follow and clean up. This strategy can lead to some problems, however. Overextending this guy can really be a problem. If he dies while you are building up for a Heat Blast of 3 or 4 dice, you almost feel cheated, because he could very easily have killed more points, but one bad roll really hurts this guy ,either on attack or defense. The nature of Heat Blast Special Attack makes Brimstone one of the more high-variance units in the game. A whiff on HBSA also can lead to some bad traps. I learned that you have to play Brimstone much more conservatively than I thought, and he can be very effective when used correctly. One game, he took out 6 Blade Gruts with a good Heat Blast. Both heroes and squads can sustain significant damage from Brimstone, and even without using Heat Blast, he still can do a bit of damage with an attack of 4 or 5. Brimstone was paradoxically bad against low-point squads and comparatively good against high-cost squads. Vipers have a field day against Brimstone, because losing 3 of them to a Heat Blast doesn’t really matter. A few good frenzies wins the day, as even 6 attacks of 3 could do quite a bit of damage to Brimstone, possibly even killing him. Brimstone functions much better against armies that tend to have expensive squads clumped in a relatively tight area. Snipers/Repulsors and Taelord were routinely beaten by Brimstone, because the Snipers tended to group around Taelord, so a single Heat Blast could get 4 or 5 Snipers, and a good roll could get earn Brimstone his points in a single attack. It is very important to manage OM’s correctly when playing Brimstone, because he really likes taking turns as often as possible to increase Heat Blast, but sometimes this again leads to overextension of Brimstone, which is hard to recover from. If you want to take a turn with another card, you need to be careful that Brimstone is not overly exposed, and will not be engaged or otherwise tied down. Greenscales help him to be able to take turns in which he doesn’t do a whole lot, but still builds up power without sacrificing all of your damage output for the turn or exposing Brimstone to the front lines. Without Greenscales, Brimstone is very ineffective, more so than the other dragons, but I don’t have a huge problem with that. Brimstone is a dragon that has a different feel than any of the other dragons, but holds his own in a fight. His Heat Blast Special Attack/Growing Heat combination is a cool new mechanic that is surprisingly intuitive, and yields really interesting strategy decisions. Above all, Brimstone is very FUN. That, combined with respectable (albeit quite swingy) damage output and interesting powers, tips the scale for me. Yeah, one more vote by my count and we get a new dragon! I’d like to nominate Sundol for SoV review. Miniature & Availability: The figure used is Fire Giant, from the Pathfinder Shattered Star set. The set just came out this year, so availability numbers are good, and stores can still order from the manufacturer. Miniature market has around 20 and ebay has at least 40 floating around in different stores. Paizo has a few too, but their cart system is strange and does not tell you exactly how many. However, since they are the manufacturer, I’d assume they have quite a few. He typically sells for around $6. The figure itself looks very nice, and fits perfectly on a DnD large base. Balance & Playability: Sundol classifies as a shark. With his big attack and the tremendous offensive potential of Blaze of Glory, he will be sure to draw attention, and with his low defense, he may not be able to take that attention for very long. 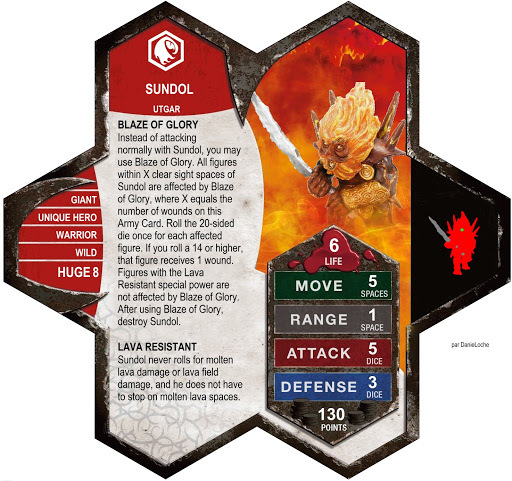 Blaze of Glory leads to some fun choices, ranging from deciding whether or not to roll leaving engagement on Sundol to risking burning your own figures to burn more of your opponents. The Firestorm is a good army for him to join because of this; it is immune to his Blaze of Glory (and he is immune to its Searing Intensity). Sundol can shine in multiplayer free-for-all games if opponents get clogged up in one central area. However, he can fail horribly in the same format; if two opponents decide to attack Sundol in successive turns, you can easily find him dead without any scorched foes to show for it. If you want to get a better idea of how he plays, I have a pictured battle report of a game involving him. Creativity & Theme: Blaze of Glory is Sundol’s main attraction. It’s a fairly simple power, and one that I think is easy to understand in one read. The double-meaning name is also kind of fun. Lava Resistant was a must have for this sculpt. I thought he was interesting enough without a third power, so I restrained myself and left him simple. I've mentioned previously that I have concerns about Blaze of Glory in a Multiplayer or FFA environment, but I'm happy to put that to the test. Sundol is original, mostly elegant, and he looks fun. to review. Blaze of Glory seems crazy powerful, but that doesn't mean broken. Difficult to say without thorough testing. Certainly a fun design with lots of theme. Vegie and I tested Sundol a few times. One time I took control of Sundol with a Werewolf Lord and blew him up. That was great, but he only killed 2 other guys. Usually the explosion is underwhelming like that, but I suppose a ton of good rolls could swing a game. That's not to say it's not fun though. Just having him on the board makes games more entertaining imo. Let me qualify this one after looking at it again. It simply says "within X spaces" with no clear sight or line of sight qualifier. That means it can hit figures on the other side of a ruin or castle wall, as long as they are close enough. Is this the intent?